Welcome to Investing Insights for the Modern Investor, a quarterly podcast to help you become a better investor so that you can grow and protect your wealth. I cover investment topics including portfolio design, cutting edge investment strategies, risk management, personal finance and any topic relevant to creating better long-term investing results. 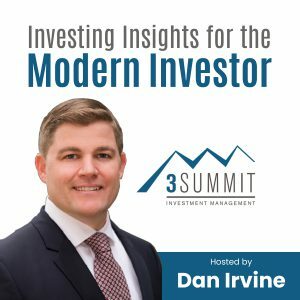 This podcast is a companion to the 3Summit Investment Management quarterly Investing Insight Newsletter. Get our quarterly Investing Insights directly to your inbox. We discuss ETF’s, what they are, how they compare to mutual funds and how ETF’s can be used to implement sophisticated quantitative investment strategies.